A larger version of the pic is here. 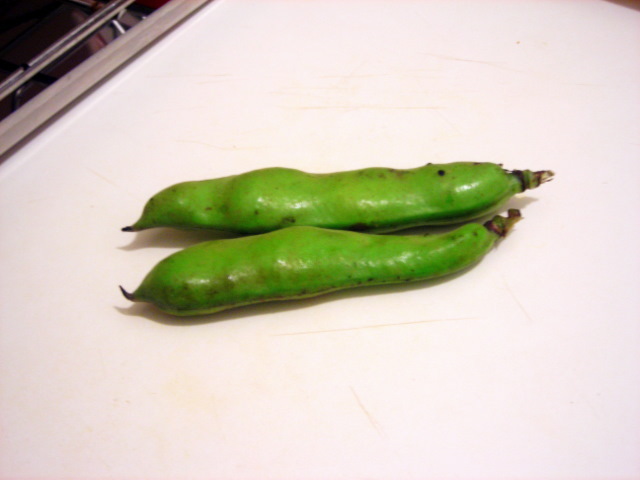 Remove fava beans from pods. 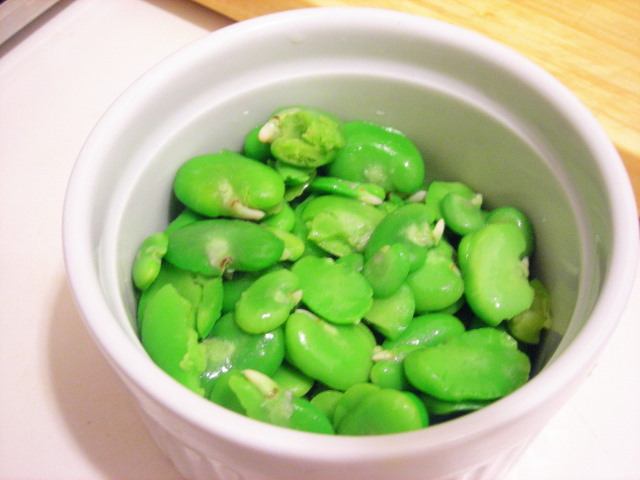 Bring a pot of water to a boil, and submerge beans for 1 minute, then blanch in ice water. Slit skin of each bean, pop the beans out and discard the outer skin. Test a bean for tenderness: if hard, simmer for 2 to 8 minutes, until tender. Cover and refrigerate until needed, up to 2 days. Pour broth into a saucepan, bring to a simmer and keep warm. Place a heavy-bottomed pot or Dutch oven and a large skillet on stove. Divide butter, garlic and shallots between the two pans. Place Dutch oven over medium heat and sauté garlic and shallots until translucent. Add rice and stir for 2 minutes. Add wine and continue stirring until all the wine is absorbed. Begin stirring in the broth, one ladleful at a time, allowing each addition to be absorbed before adding the next. Meanwhile (after about the second or third ladleful of broth), place skillet over medium-high heat. Stir until garlic is light gold. Add summer squash and sauté 2 to 3 minutes. Remove from heat and set aside. When most of the broth is incorporated, taste rice; it should be creamy with a slightly firm center. Remove from heat and stir in ricotta. Cover and allow to rest for 1 minute. Meanwhile, return squash mixture to medium heat. Add favas and season with salt and pepper to taste. Stir just until mixture is warm, then remove from heat. Add half the basil to squash and mix gently. 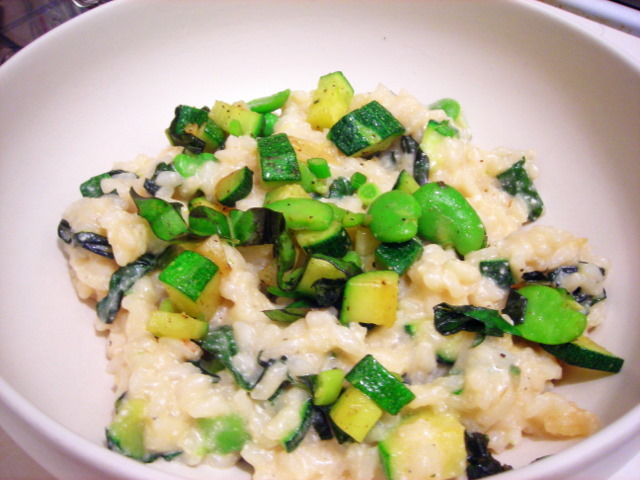 Stir remaining basil and garlic scapes into risotto. Place a portion of each on plates and serve immediately. 10 Jul	This entry was published on July 10, 2009 at 2:46 am. 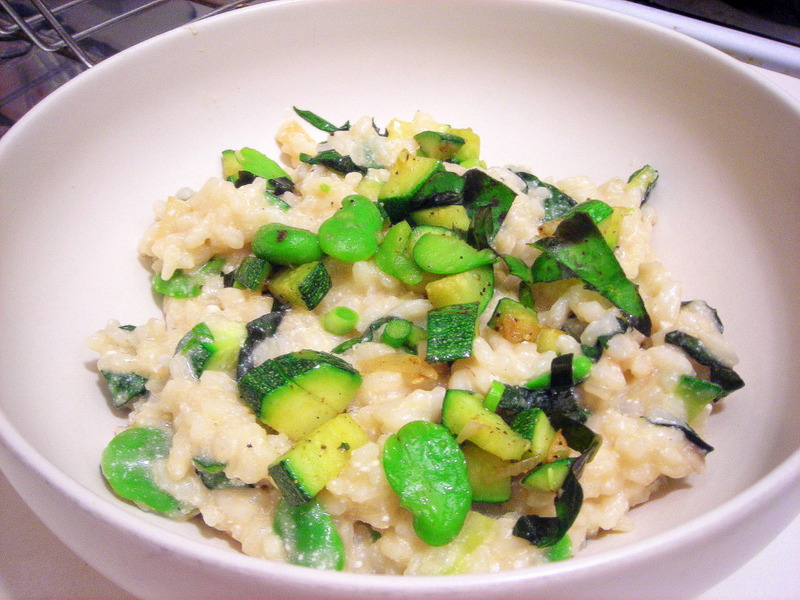 It’s filed under food, general, summer, vegetarian and tagged fava beans, ricotta cheese, risotto, seasonal and local, slow food, summer squash, vegetables, vegetarian. Bookmark the permalink. Follow any comments here with the RSS feed for this post.